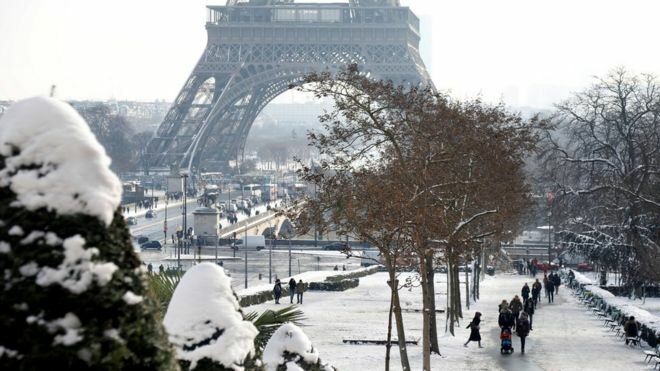 Paris's Eiffel Tower, which attracts six million tourists every year, will remain closed until Sunday as a result of heavy snowfall in the city. The tower, a symbol of Paris, has been closed since Tuesday. Officials say it is too dangerous for tourists to visit because of the risk of slipping. 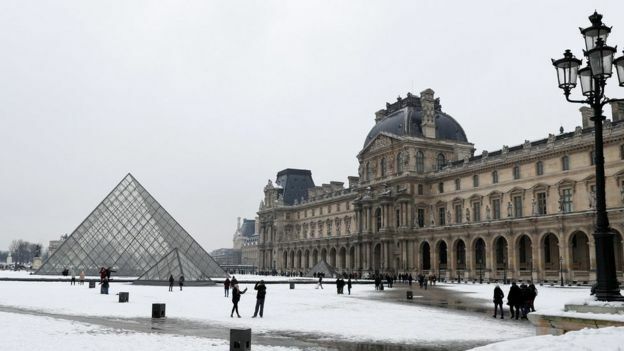 The Paris City Hall says the level of snow that has fallen since Tuesday is "unprecedented since 1987", with 12cm falling in one 24-hour period. Heavy snow has caused great disruption in northern France this week. In Paris, skiers were pictured on the slopes around the Sacre Coeur cathedral on Wednesday. At the Eiffel Tower, snow has turned into ice on platforms and stairs, making it difficult for tourists to move about. Normal methods of de-icing cannot be used because salt would corrode the type of iron with which the tower was made and sand gets into the cogs of the lifts, officials say. Parisian authorities have banned heavy goods vehicles from the city's streets as a result of the heavy snowfall.